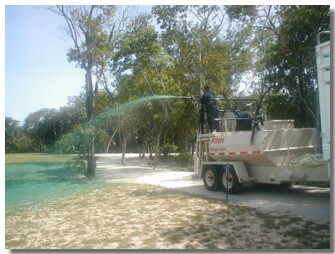 Hydroseeding is the technique of spraying a slurry of seeds, tackifier, mulch and fertilizer on bare ground (often steeply sloping) to hold soil in place while awaiting germination of a ground cover. It costs 50% less than the price of sod. Purchasing sod is very expensive and the cost of labor is high. Hydroseeding requires less installation and material than sod, and gives you a healthy lawn for a fraction of the cost. The lawn quality hydroseeding is much healthier, greener, and lasts longer because the root system is grown deep in the soil. Sod has to be transplanted and can experience shock in new soil. Hydroseeding provides a uniform, thick lawn that doesn’t have the threat of seams showing or patchiness. Hydroseeding also gives you the control to cover difficult, inaccessible areas like slopes that are impossible to sod. Hydroseeding is the only method of turf establishment that retains the most moisture and protects from animals and weather conditions because of the slurry-formula components. Unlike hand seeding and sod, hydroseeding has very little watering demands, drought or washout. Hydroseeding provides the ideal environment for germination and erosion control without the downfalls of other methods.